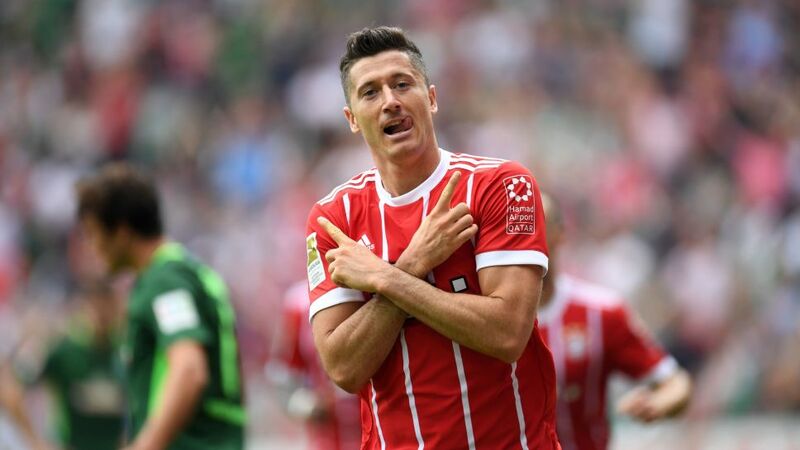 Bundesliga | Bayern Munich's Robert Lewandowski the world's best striker? Bayern Munich's Robert Lewandowski has scored 60 Bundesliga goals over the past two seasons. Bayern Munich's Robert Lewandowski the world's best striker? If there is one player capable of breaking the Cristiano Ronaldo-Lionel Messi duopoly on the World Player of the Year awards it is Bayern Munich front man Robert Lewandowski. The Poland captain boasts an arresting repertoire of strikes, but it is not just his goals that do the talking. The statistics speak for themselves. His eight-goal debut season haul of 2010/11 the exception to the rule, Lewandowski has comfortably hit double figures in each and every Bundesliga campaign since: 22, 24, 20, 17, 30 and 30. The 29-year-old ranks second to veteran Peruvian Claudio Pizarro (191) on the Bundesliga's all-time list of foreign scorers, and third behind Pierre-Emerick Aubameyang and Gerd Müller in the minutes-per-goal department (118, 117, 105). Happily helping himself to goals which range from the simple to the spectacular – with both feet, from open and set plays - Lewandowski sits well in the company of legends. His Bundesliga report card includes 35 braces, five hat-tricks and one historic five-goal haul. Of his 15 attempted penalties, he has only missed one. Bayern's imperious No.9 recently added postage-stamp free-kicks to his inventory, too. In 228 Bundesliga appearances to date, he has rattled off 152 goals. Lewandowski also has a creative side. Not a single member of the Bundesliga's current cast of forwards comes close to matching the Warsaw native's impressive tally of 54 assists; the product of a cushioned lay-off, eye-of-the-needle through-ball or visionary punt more typically associated with midfield masters and roaming wide men. The ex-Poznan man is rewriting the all-round striker's rule book, and then some. Lewandowski's eye-watering numbers are made possible by a devotion to his craft shared by only a select few of his peers. Nicknamed 'The Body' by former Dortmund team mate Nuri Sahin, he has the physique of an L.A. fitness model, the agility akin to an Olympic-gold-medal-winning gymnast and the raw power to pull a truck. Testament to his peerless conditioning, he has only missed 11 matches in seven full seasons of Bundesliga football. Prolific, selfless and as fit as a fiddle, Lewandowski has to be considered one of the, if not the, most complete striker in world football today – think Ronaldo and Zlatan Ibrahimovic rolled into one. The indomitable Pole is yet to make a FIFA Best Player three-man shortlist, but 2017/18 could be his year. Suffice to say he would be a worthy recipient of the beautiful game's most prestigious individual award. Quiz: How well do you know Robert Lewandowski?